Get your party POPPIN’ with our MAD-ly irresistible crunchy Caramel corns or creamy Butterscotch popcorn. Our glazes are gluten free and vegetarian friendly. 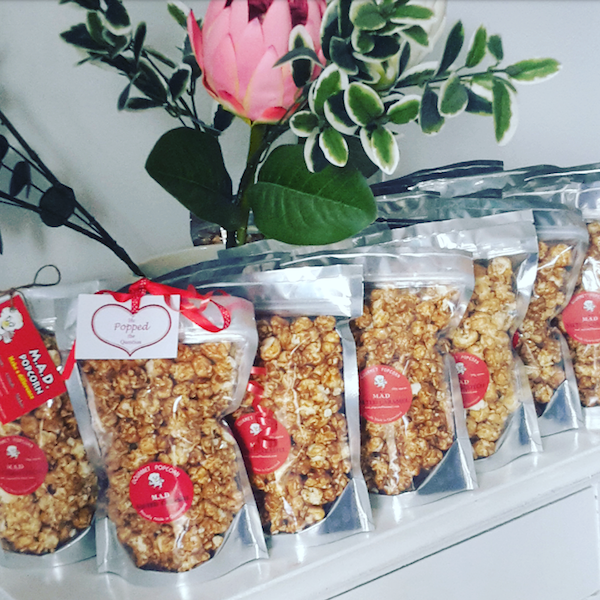 Popcorn is the only way to say, “You make my heart POP!” and a lovely way to thank your guests with customised favours or Bonbonnieres “Thanks for POPPIN’ by!” A fun and heartfelt way to include your guests when you tie the knot, as they can eat a little, or eat a lot! We are more than happy to create custom packages for your special day. And always remember, life can be salty, but love is sweet.